In a near future, the world's population has decreased dramatically due to a deadly virus that terrorized the whole planet. Now people eat only synthetic food and tend to avoid as much as possible any form of physical connection or "real contact" with living creatures. Real shops have disappeared from the streets, and with the exception of the community centers (what were once called schools), people communicate with each others exclusively online. But even in this tightly controlled and systematized society, there is a group of young girls who actively pursued real contact. And when a string of brutal murders emerges, their challenge to this closed world is just about to begin. 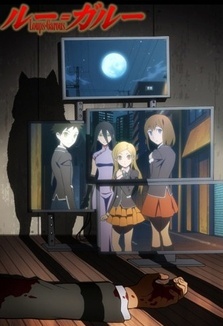 Watch Loups=Garous Episodes Online at Animegg.org. Loups=Garous is available in High Definition only through Animegg.org. Choose an episode below and start watching Loups=Garous in Subbed & Dubbed HD now.